Old Town Academy is a K-8 charter school focused on Core Knowledge, Project-based Learning and Digital Literacy. Rooted In Place collaborated with the OTA 3rd grade class to create a beautiful monarch waystation at the school. Inspired by an OTA parent who was battling terminal breast cancer, the garden not only teaches the students the life cycle of the Monarch, but also provides much needed habitat for the butterflies in urban San Diego. Students, parents and staff worked together to create this magical garden for Sara and the Old Town Academy community. Old Town Academy is a K-8 charter school focused on Core Knowledge, Project-based Learning and Digital Literacy. The third-grade class at the Old Town Academy (OTA) received a grant for the design and installation of a monarch way station on the campus. 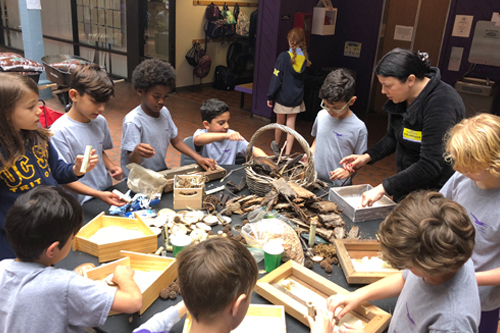 Working with teachers, parents, and students, Rooted In Place transformed the central courtyard and the front of the school into a lush butterfly habitat with hundreds of native, butterfly attracting plants. The OTA Monarch Way Station teaches the students about the life cycle of the Monarch while providing much needed habitat for the butterflies in urban San Diego. Rooted In Place facilitated a volunteer build with the 3rd graders, teachers and parent volunteers to build the waystation. Butterfly attracting plants were planted in the central courtyard, where students pass through between classes and along the front of the school and playground creating a beautiful connection between the school and the community. To further connect the students with the butterfly waystation, artist Kline Swonger painted a mural denoting the metamorphosis of a butterfly. Students were immediately lured in by the beauty of the mural and engaged with the diagram showing the metamorphosis of a butterfly. Students helped to create bug homes, constructed of salvaged wood frames and filled with seed heads, yarn, salvaged lumber and bamboo. These bug homes were installed in conjunction with the planting as another element to draw students in to observe the beauty of nature. Lastly, wood butterflies painted by the students were strung across the courtyard and hung in a way which allowed them to dangle and flow with the movement of the breeze. A small project, but mightily layered with opportunities to engage, observe and learn about butterflies and nature.